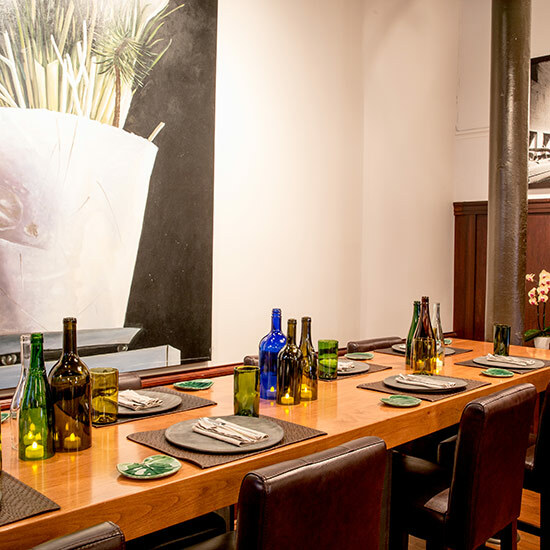 Here, a look at one San Francisco restaurant's hyper-artisanal approach to dining. At any hot new San Francisco spot, it’s almost a given that the ingredients will come from local purveyors. But at the month-old chef’s table upstairs at Charlie Palmer’s Burritt Room + Tavern, which goes by the name BR+Table, the dishes themselves—along with the glasses and the table and the linens—are local, too. Here, a look at BR+Table’s hyper-artisanal approach to dining. They’re the result of a collaborative effort from chef Luke Knox and artist Jennifer Issaverdens of Issa Pottery, located in Sausalito. Made with California clay, these dishes are meant to feel natural and organic with colors that evoke the state’s forests and mountains, as well as the Pacific Ocean. Issaverdens created the drinking glasses from recycled wine bottles. While not all of the bottles originated in California, the wines were all drunk locally. It was all sourced from local flea markets and dates to the 1930s, a nod to the building’s past life as a speakeasy during Prohibition. The napkins and placemats were handmade by Alonya Van Rooyen, a South African expat now living in Sausalito. The placemats are made from vegan leather (synthetic leather) and the napkins are 100 percent linen. Andrew Garay of Gotham Bay Construction (located in nearby Emeryville), who was responsible for the build-out of Burritt Room, oversaw the design of the solid alder wood dining table. Name your favorite artisans on Twitter and Instagram using #FWArtisans.